The right-back has been one of the Shrimps’ star performers this season despite battling a hernia problem in the first half of the season. Mills, who joined Morecambe over the summer, was a regular until the end of November when he finally went under the knife and missed five games as a result. “I’m starting to feel good,” said the 26-year-old. “I’m slowly getting there but it has taken me a bit longer than I would have liked I must admit. Mills’ willingness to get forward from right-back has given Morecambe’s attacking play another option this season. Now, with the arrival of Ritchie Sutton, Mills could find himself playing higher up the field. Sutton’s debut in the goalless draw at Exeter City last weekend saw him join Sam Lavelle and Steve Old as part of a back three. That change in formation saw Mills move to a wing-back role with Luke Conlan doing likewise on the left-hand side. 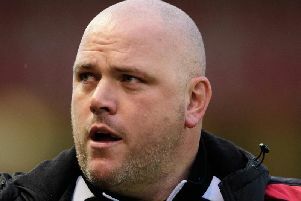 The clean sheet and a point leaves Morecambe boss Jim Bentley with a selection dilemma as they seek a second victory in 12 league and cup matches. “I’m happy to play wing-back, right-back or centre-half,” Mills said. “I do like to get forward and the back-three system that we played on Saturday does give me a bit more licence to go up the pitch.